I was working on some other posts for you all when my friend called me this morning to tell me that my loctician, Eboni Dodson, was killed last night by a drunk driver. Apparently she was having car trouble and she and a few others were trying to push the car off of the road when a pick-up truck hit her car. The others saw the truck and were able to move out of the way but she was inside the car and was hit. I've known Eboni for years.... she worked in the same salon as my nail artist and was a mutual friend of a good friend of mine so I've been to social gatherings with her a few times. Eboni started my daughter's locs two years ago, and I myself turned to her just a few months ago to start my new set of locs. 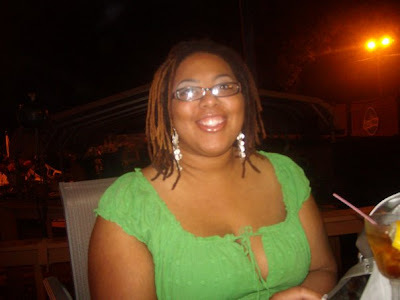 I loved her sweet, funny, talkative, outgoing and overall positive nature.... just the type of person who should be cultivating and styling locs. I only had the chance to sit in her chair once, but was looking forward to the day when my locs were finally fully matured and I could return to experience more of her talent. Sadly, now I will never get that chance. My prayers go out to her young child, her girlfriend, her family and friends. My heart weeps today over the loss of such a beautiful person. Rest in Peace Eboni.... you are loved and missed.